Sprawling Brick Ranch 4 Bedroom, 3 Bath home with basement and attached 2 car finished garage, workshop area, door opener& concrete floor. Majestically perched on a mostly level hilltop lot 2.36 +/- acres close to town overlooking the retail business area, Holzer Medical Center & the Appalachia Valley with plenty of room for garden and recreation space! The asphalt driveway with turn around and basketball court leads you to your new home with concrete walkway, shingle roof and front covered porch. The main floor offers: Formal Living Rm apx. 20’ by 12’ with 9’ picture window; Formal Dining Rm apx. 10’10” by 12’ with 7’ picture window; Huge apx. 30’ by 14’ open concept Kitchen, Dining Rm, Family Rm Combination offering Kitchen with 17 ft. of top & bottom cabinetry and counter top & the following built in appliances Maytag Dishwasher, electric oven, electric range top, and Frigidaire Side by Side Refrigerator, also reverse osmosis purified drinking water system and instant hot; Family Rm offering a MASSIVE EXPOSED BRICK Hearth Wood Burning Fireplace from floor to ceiling; Bedrm w/ closet; Full Bathroom with shower; Bedrm with closet; Bedrm with double door closet; Full Bathrm; (2) Linen Closets; Master Suite with (2) double door closets and attached full shower bathrm. Utility Area with cabinetry and washer/dryer hookup. The home’s basement consists of: Large Finished Rooms carpeted, another fine offering from this home ; Home equipped with 200 AMP Breaker Box, Electric Hot Water Tank, Mostly copper plumbing, County Water, Sewage System and Nu Tone Central Vacuum. 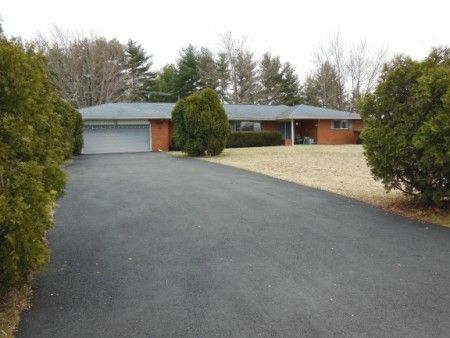 Great location in Jackson, OH and is encompassed by beautiful towering white pines on this apx. 2.36 acre lot with plenty of garden space. 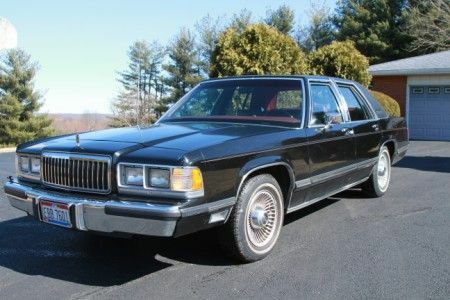 1991 Model Mercury Grand Marquis LS 4 Door Super Nice Car Clean! Showing 45,851 miles, Leather Interior, Power Windows. Cub Cadet Riding Lawn Mower 3206 with wheel weights and snow plow ready! Showing 530 Hours. Sold separate Cub Cadet snow plow attachment and snow blower. Real Estate Terms: Minimum Bid $37,500; $7,000 down at time of sale cash/check; close on or before July 5, 2014. Selling in AS-IS condition on site, NO buyer cotingencies exist. All information provided is to be utilized only as a guide. Buyers are relying solely on their own independent inspection, inquiry, investigations and due diligence regarding to property. Buyer agrees and understands that the seller and seller's agent makes no warranties or representations of any kind either expressed or implied as to the condition, quality, and merchantability or fitness for a particular purpose for the real estate or any part thereof and/or serviceability for the same. This agreement is solely between buyer & seller. Stanley & Son, Inc. and its agents are exclusive agents for the seller. Any announcements made only by the auctioneer from the podium during the time of auction will take precedence over any previously printed material and/or any other oral statements made or implied. No liability exists regarding the information contained in any printed matter for its accuracy, errors or omissions. Personal Property Terms: Personal Property Terms: Sold As-Is No warranties or guarantees; No Minimums or Reserves paid in full at time of sale cash or check.